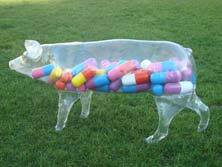 Today on the show we take a look at the drugs we feed to livestock, and how that affects human health. First, Dr. Lance Price joins us. Today on the show we take a look at the drugs we feed to livestock, and how that affects human health. First, Dr. Lance Price joins us. He’s the author of a study that links the use of antibiotics in livestock to the development of drug resistant bacteria. Then we speak with Dr. Keeve Nachman, from the Farming for the Future Program at the Center for a Livable Future at Johns Hopkins. He joins us to talk about a bill that recently passed the Maryland Senate and House that bans the drug roxarsone from chicken feed in the state.